Consumers will once again swarm the malls this December 24...desperate for last minute holiday gifts...while designers and artists offer original one-of-a-kind gifts for a fraction of the cost. Here is a sampling of local jewelry and accessory designers located right here in LA. Go right to the source and surprise your loved ones with original homegrown designs. Born in Brazil, Julio Benez has been collecting stones since he was six years old. He was always drawn to designing jewelry, but instead worked in customer service for an IT company. He gradually began designing on the side and living his dream of creating wearable art. He attended the Gemological Institute of America and graduated in 2005. He collaborated with other designers and launched his own business in 2011. Today, he creates new designs on a daily basis, working out of LA. "I use a top of the line 3D design and manufacturing process which allows me to cut time and make it affordable. Because I make it locally, I can find better quality gemstones for better prices. I only sell in my store." 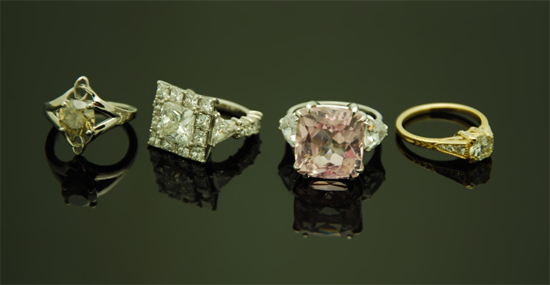 Benez said that he finds inspiration through various cultures, such as his triqueta design for his lemon champagne diamond (first ring from left). "This was inspired by a Celtic design. Triqueta is one of the most famous Celtic symbols and a wonderful option to adorn this special gem." Canadian born artist Jennifer Verge was first inspired to create her own jewelry by putting a positive spin on a bad situation. When she moved to LA, her home was burglarized and all of her jewelry was stolen. She was devastated, since she lost sentimental pieces belonging to her mother who had previously passed away. She explained, "As a reaction, I started making my own jewelry. I started wearing it around Venice (where she currently lives), which caught the attention of the locals, and they inspired me to create my own line of jewelry." 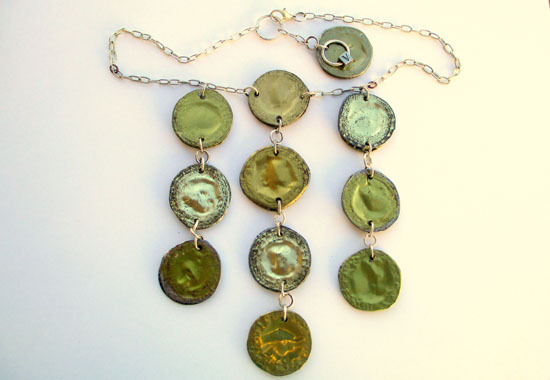 Created from recycled bottle caps, Verge's jewelry resembles the appearance of coins. She cleverly combines second hand charms and reclaimed keys expressing her authentic style. The Looksy Bracelet is "the mirror you wear." It's a fun, fashionable, genuine leather bracelet with a mirror to check your look with a flip of the wrist. Los Angeles designer Lee Lucas first came up with her concept for the Looksy Bracelet in 2010, when she needed to do a quick lipstick check while on stage with her band. It has since become a popular item online. Worn by celebrities, performers, and people of all ages, it is also being sold on Rodeo Drive. Lucas said she was pleased to receive an email from a North Carolina mom saying, "Due to surgery, my ten year old can not feel his upper lip. The mirror allows him to check himself regardless of where he is, for food, etc that he can't feel. It's a life saver for us." 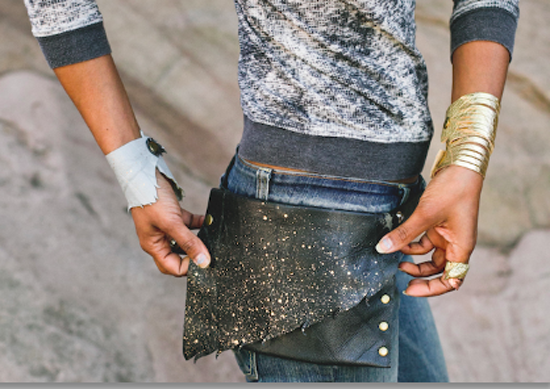 The Looksy Bracelet is created with locally sourced materials and is made in the USA. Current colors include: Pink, White, Red, Royal Purple, Green, Blue, Black, Brown, and Faux Leopard. "I come from a family of amazing artists & designers," said Topanga designer Fahmina. "I loved making wearable art since I was a child." Fahmina spent much of her early years surrounded by fashion. Starting out as a young model, both her mother and sister were aspiring fashion designers. "I had a fierce sense of fashion with bold styling attitude," mused the designer. Keeping with her eco conscious beliefs, she started a "green" line of jewelry and accessories. One of her earliest creations was the Fahmina Fanny Clutch (made from salvaged leather), which has a detachable strap and can be worn four ways. "I launched a line of soft-framed clutches (in 2001). They can be worn on your hip, as well as across your body, off the shoulder like a purse, or take the strap off and it's a clutch." Another top seller is her slit cuff, which she designed to look like stacks of bangles. "I believe in strong statement pieces as accessories, without looking like you put too much effort into it." This past year, Fahmina and Illya Dhuznia founded ROAM Creative (115 Topanga Canyon South. Topanga 90290), an urban art shop/mini gallery located in Topanga Canyon. "We feature wearable art, visual art, performing arts, music, etc.," explained Fahmina. "We also hold once a month art opening events showcasing amazing artists from the local L.A. area and abroad." You may even catch Fahmina spinning some tunes at an upcoming Roam Creative event as she used to be a DJ on KPFK Radio.